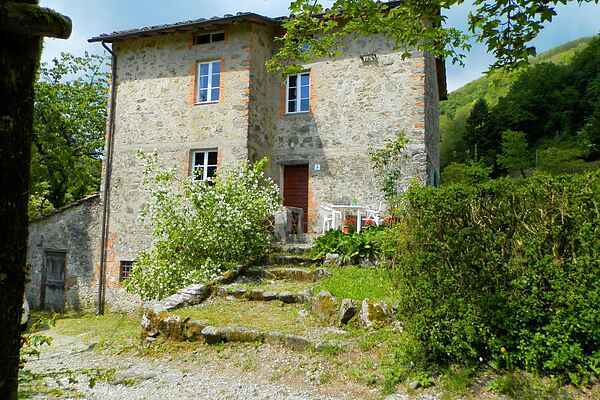 Casa Paola is a beautiful, rustic, original Tuscan house, located in a quiet location is in the hills. It lies on the border between Tuscany and Liguria, in the natural park of Apuan Alps. The house is spread over two floors with a comfortable, attractive interior. You will be surrounded by a garden of 250 m with garden furniture and a barbecue to enjoy the peace around you. Trebbio is situated 20 km. north of Lucca. So if you want to get away, this congenial city is just around the corner. In addition there are many small but nonetheless very interesting villages nearby. You can find almost every day a market for the Tuscan ingredients, and culture to soak up! Restaurants/Pizzeria La Fonte da Daniela, distanza 100 m. Molin della Volpe, dis. 2 km. Da Valentino a Fiano, dis. 2 km. La Sosta a Pascoso, dis. 5 km. Markets Borgo a Mozzano, venerdì mattina, dis. 10 km Bagni di Lucca: Villa, mercoledì e sabato, dis. 14 km Ponte a Moriano, martedì, dis. 12 km. Public swimmingpools Borgo a Mozzano, dis.10 km Bagni di Lucca (termal) 14 km . Horseriding: Horse on the road, at Torcigliano, dis. 5 km. Sea/ beach: Viareggio 35 km Lido di Camaiore 40 km. The house is near Lucca. In the weekend of 17 Oktober 2016 there is the Lucca Comics Festival. A real must- see!